McCain to Trump: Don’t You Dare Make Peace with Russia! Sit down. This is going to shock you. (Not). We reported yesterday on the telephone call between US president-elect Trump and Russian president Putin, where the current and future presidents discussed the need to set aside differences and look to more constructive future relations. With serious observers of this past year’s increasing tensions between US and Russia openly worrying about a nuclear war breaking out, with some 300,000 NATO troops placed on Russia’s border, with sanctions hurting average businesspersons on both sides, a normal person might look at the slight thaw in Cold War 2.0 as an early positive indicator of the end of the Obama Era. Sen. John McCain (R-AZ) begs to differ. In a blistering statement he released today responding to the Trump/Putin telephone call, Sen. McCain condemned any efforts by President-elect Trump to find common ground with Putin. We should place as much faith in such statements as any other made by a former KGB agent who has plunged his country into tyranny, murdered his political opponents, invaded his neighbors, threatened America’s allies, and attempted to undermine America’s elections. Interesting that Republican McCain has taken to using the Hillary Clinton campaign line (the one that lost her the election) that somehow the Russians were manipulating the US electoral process. The claim was never backed up by facts and Hillary’s claim that some 17 US intelligence agencies agreed with her was shown to be a dangerous and foolish lie. Why is Putin not to be trusted, according to McCain? Vladimir Putin has rejoined Bashar Assad in his barbaric war against the Syrian people with the resumption of large-scale Russian air and missile strikes in Idlib and Homs. Another brutal assault on the city of Aleppo could soon follow. What McCain doesn’t say is that unlike US troops in Syria, the Russians are invited by the Syrian government and operate according to international law. Oh yes, and they are also fighting al-Qaeda and ISIS, which has sought to overthrow Assad for the past five years. 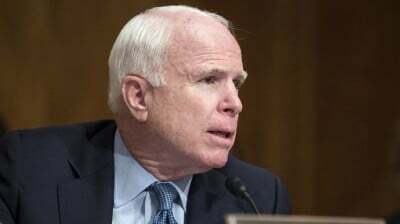 Maybe McCain is just really sensitive after meeting with al-Qaeda and ISIS in Syria?